Thanks so much to Sarah Hardy from Book On The Bright Side for bringing this book to my attention and allowing me to be part of the blog tour. 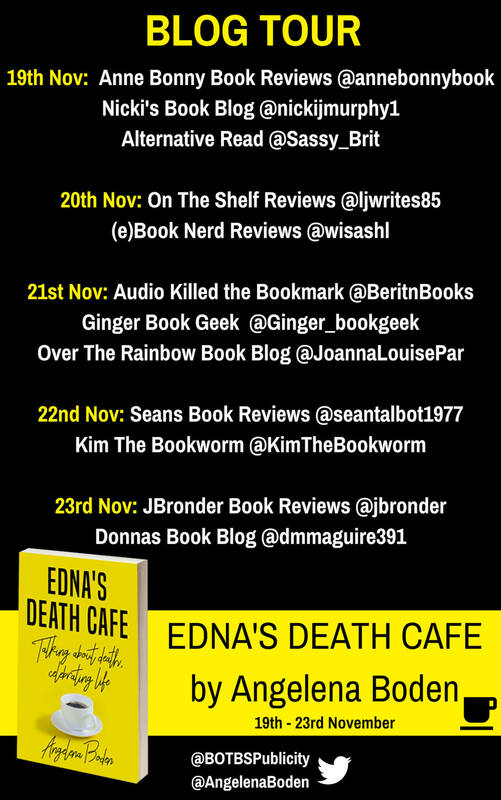 Edna’s Death Cafe by Angelena Boden is a book that everyone should read. It’s a life-affirming, and life-teaching book. As someone who has lost a few people along the way including both parents, this book was a wonderful read and certainly got me thinking about lots of different things, including what I’d want at my funeral, and how I’d like to celebrate my life when it’s my time to leave and reminding us also of saying the things we need and want to say and doing the things that we need and want to do. I think it was really brave of the author to take a topic such as this and to make it into a novel. Really cleverly written. That makes it sound like it’s a really morbid book, which it really isn’t. It’s a lovely book with a really great plot line, where Edna, who is a truly lovely character that I really bonded with, has lost someone she loved dearly, and how she’s coping with her loss, along with the fact that someone seems to be jeopardising her business, her friendships and ultimately her life. I do think the culprit was quiet obvious, but that didn’t take anyway my enjoyment. I felt like I was involved in the mystery solving and really enjoyed reading about this lovely community who all pulled together and affected by death in some way or another, some more tragic than others and all trying to help each other cope with their feelings. It was a really enjoyable book, very cleverly written, that stirred up lots of emotions within me both sad and happy. Most entertaining! Soon, a series of events begin to unfold which threaten to undermine Edna’s livelihood and theDeath Cafe meetings. These events just happen to coincide with the arrival of a mysterious stranger into the village. 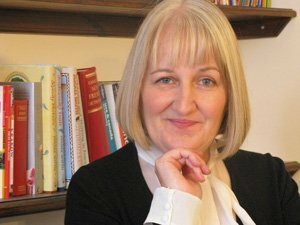 Angelena Boden has spent thirty- five years as an international training consultant, specialising in behavioural management and conflict resolution. She trained in Transactional Analysis, the psychology of communication and behaviour, her preferred tool for counselling and coaching. She originates from the Peak District but has spent a life time travelling and living in places as far apart as Vancouver, Dubai, Paris, Seville and Iran. Now semi-retired in Great Malvern, she writes every morning, walks the hills and paints landscapes every afternoon and fits family and reading in between. She is the author of two traditionally published novels and many articles and blogs. 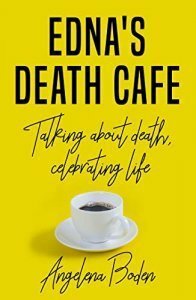 Her most recent novel, Edna’s Death Cafe is published as an e-book by Matador. Angelena is keen to meet readers, old and new, and is available for book talks, events, and always chatting over a cuppa (within 60 miles of Worcester). There’s a blog tour taking place for this book right now, and here are the people taking part. Take a look at their thoughts for this great book too.